We harvested a ‘grand’ total of £65 worth of veg this week, excluding anything from the store. We had 28 meals with ingredients from the allotment. Here’s a photo of one of the harvests. 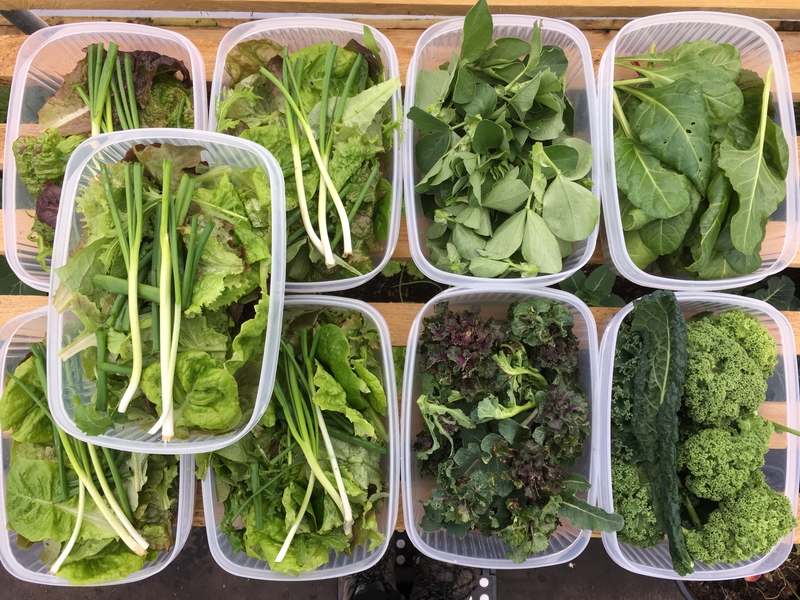 We picked new potatoes, broccoli, sprouts, brocollini, lots of types of kale, kalettes, red and golden beets, spring onions, celery, rocket, lots of bean tops and loads of lettuce. We also raided the store for: carrots, potatoes, onions, shallots, garlic, red cabbage, red beetroot and dried pears/apples. Then a video of me talking to the camera about what’s unique and wonderful about an allotment? I’ve planted Deuce Provence and Oregan Sugar Snap Peas, these are in pots in the polytunnel and at the back of cold-frames. The salads are really good, last year we had none to pick at all, so despite the challenges of 2018, we are doing OK.
I’ve had ‘flu’ for half of the week and I’m still feeling full of cold and weary. In addition all of my upper legs (trunk to knees) is covered with an incredibly itchy rash, that is driving me just a little bit crazy! We’ve got a few aphid problems in the greenhouse and polytunnel, so I’ve made up a batch of home made garlic spray and I will be using that regularly from now on. A few of the lettuces had downy mildew on the leaves and we losts a few plants to rotten stems.